Thinking about buying or selling - contact the Grove Team, Keller Williams to get the process started. Find us at the office, (817) 337-0000 or online, www.groveteam.com. Are you thinking of refinancing your mortgage? Here are five things you don't want to do. Refinancing could save you a lot of money. That is, if it's done right and under the best circumstances. But do it wrong and it could cost you - a lot. "Every person's situation is different, so it's a case-by-case question of whether refinancing makes sense. It doesn't make sense for everyone, and people should know the potential costs going in," says Jim Duffy, a mortgage banker with Cole Taylor Mortgage. Shopping is your right. Shopping is American. Shopping is just plain smart. And when refinancing, you should always shop around. "While there's not a lot of difference in rates right now, that doesn't mean you shouldn't shop around," says Chris Boulter, president of Val-Chris Investments, Inc., a California-based company specializing in residential and commercial loans. He says one thing that could vary from lender to lender is the mortgage terms, such as closing costs and fees. These can make a difference in the up-front cost of refinancing your loan. For instance, on a $300,000 mortgage, just a quarter of a percent difference in the up-front costs means a difference of $750. But of course, the biggest contributor to your mortgage costs is the interest rate you pay over the life of the loan. For that reason, says Boulter, it's vital you get the lowest rate you qualify for. In fact, even a quarter of a percent difference between lenders can really add up. Don't believe us? Let's check the math. Below is a comparison between two $300,000 mortgages. Both are 30-year fixed-rate loans, but Loan A has a 3.5 percent interest rate*, and Loan B has a 3.75 percent interest rate (a quarter of a percent higher). The Lesson: Shop till you drop! Or at least collapse in a state of money-saving grace. Why? Because negotiating a quarter percent drop in interest rates could result in more than $15,000 in savings over the life of your loan. And you'll be reminded of that monthly with a $42 lower payment. If you thought those nice lenders would refinance your loan for free, well, think again. Refinancing is a service, and you've probably noticed banks (lenders) generally like to charge money for services. And when it comes to closing costs and fees, ignore them at your own peril. That's because closing costs and fees could outweigh any refinancing savings. To see why, let's take a closer look at some specifics. In general, closing costs add up to about 1 percent to 1.5 percent of your loan amount, says Jim Duffy. On a $300,000 loan, that's $3,000 to $4,500. And in case you're wondering, closing costs and fees typically include things like loan origination fees, application fees, appraisal fees, and other charges, according to a refinancing guide published by the Federal Reserve System, which oversees national monetary policy and the banks. The Lesson: Make sure refinancing your mortgage is worth the cost. Duffy says a rule of thumb is that if you can lower your interest rate by enough to pay for the closing costs and fees within 18 months, it's generally a good idea to pursue refinancing. Mortgages last for 30 years, right? Right. Unless it's a 15-year mortgage. Yep, it turns out you have a choice, and choosing wisely could either save you a lot of money or lose you a lot of sleep. "Typically, you'll get a slightly lower rate on a 15-year mortgage than a 30-year one," says Duffy. "But the real savings come in the amount of interest you pay over the life of the loan." He explains that because you're paying off your loan in half the time, you could save tens or even hundreds of thousands of dollars, depending on the amount of the loan. However, there is one thing you need to understand: Even with the lower interest rate on the 15-year mortgage, your monthly payment will be higher. This is because you're paying off the loan in half the time and the principal (the amount you originally borrowed) remains the same, says Duffy. So it takes bigger payments to pay it off sooner. But enough with the talk; let's move on to another example of why you shouldn't overlook shorter-term mortgages. For this one, we'll compare two mortgages of $300,000. The first will be a 30-year, fixed-rate loan with an interest rate of 3.5 percent*; the second will be a 15-year, fixed-rate loan at 2.75 percent*. The Lesson: If you can handle the higher monthly payment, consider a shorter-term mortgage. You could save a lot in interest and own your home outright in half the time. That's about as far from a blunder as you can get. Have you been teased by those adjustable-rate mortgage rates that dip below 3 percent? While they are very attractive, it's good to note that they're likely to adjust upward when they do change, says Duffy. But before we get to that, let's nail down exactly how an adjustable-rate mortgage (ARM) differs from a fixed-rate mortgage. For that, we'll turn to the Federal Reserve's handbook on adjustable-rate mortgages. "An adjustable-rate mortgage differs from a fixed-rate mortgage in many ways," notes the Federal Reserve. "Most importantly, with a fixed-rate mortgage, the interest rate stays the same during the life of the loan. With an ARM, the interest rate changes periodically, usually in relation to an index, and payments may go up or down accordingly." The most common ARM stays fixed for five years, then adjusts every year or even six months, says Duffy. Duffy and Boulter both recommend against ARMs except in very specific cases, such as a borrower being dead certain they will be selling their home within a few years. Otherwise, says Duffy, they're missing out on locking in a historically low interest rate and getting long-term savings, and instead, enjoying only short-lived gains. "My recommendation is to remind [homeowners] that while that 2 percent rate is attractive now, it will adjust in year 6 and it's probably going to go up, because with rates this low, there's not much room for it to go down," says Duffy. The Lesson: While no one knows what the future holds, with interest rates so low currently, Duffy says that getting an ARM and giving up the security of a fixed-rate mortgage makes little sense. Do you know what your home is worth? It's an important question if you're thinking of refinancing your mortgage. Why? Because it could affect many things, from whether you qualify for refinancing to the rate you pay, or if you have to pay private mortgage insurance (PMI), says Duffy. The best case scenario, he says, is that your home is worth at least 20 percent more than the mortgage amount. In other words, you are trying to refinance only 80 percent or less of your home's current market value (and yes, the lender will want a professional appraisal). What if your situation isn't the best case scenario? Don't fret. With other qualifications such as good credit and a stable job history, you still have hope - though you may not be able to get the lowest rates. What's more, if you don't have 20 percent equity, you'll likely also have to pay private mortgage insurance (PMI), which is often required by lenders to insure them against you falling behind on your loan payments, according to the Federal Reserve. In case you're wondering, Duffy says PMI costs range depending on the amount of equity you have, the amount of the loan, your credit score, and possible other factors. As an example, he says, for a $300,000 loan, it could range from $50 to $200 per month. The Lesson: Before you start down the paper trail of refinancing, have a sober assessment of how much your home is worth. If you have less than 20 percent equity, make sure you can reduce your mortgage interest rate by enough to make up for the added cost of PMI. *The November 8, 2012 average for 30-year fixed-rate mortgage was 3.4 percent and 2.69 percent for a 15-year, fixed-rate mortgage, and 2.73 percent for a 5/1 ARM, according to Freddie Mac, an institution established by Congress in 1970 to provide liquidity, stability and affordability to the nation's residential mortgage markets. Traditional and cool color choices both feature enhanced sustainability with virtually zero maintenance, extreme durability, recyclability and a limited lifetime warranty. The tiles' UV-protected blend of virgin resins and natural limestone delivers Class A fire resistance, Class 4 impact resistance and a 110 MPH wind uplift rating - all with the artistic, detailed texture of tiles cast from real slate. "InSpire gives you a handsome slate appearance without the cost and substantial weight, but adds consistencies with color, texture and toughness that you can't find in real slate," says Jonathan Wierengo, vice president of marketing for The Tapco Group, maker of InSpire Roofing. "The range of Traditional and Architectural color choices with InSpire allows it to fit a variety of styles, including log cabin or Mediterranean style, where most people wouldn't even think of installing a slate roof." Texas custom builder Sheldon Robinson likes to use multiple InSpire colors for his homes - he's used up to eight colors on one roof. "When people pull up to see a home, it just presents a whole different look. When people see that roof, they're just - pardon the pun - inspired. It delivers more of an authentic slate look. We can lay out a pattern for a client and say 'here's the concept, here's what's interesting,' as opposed to a typical all-black or grey roof," Robinson says. "Today's new homes and home remodeling projects embrace far more open designs, allowing for unprecedented levels of flexibility. These floor plans permit gatherings to spill out of the dining room, family room or living room into adjoining spaces with no loss of sociability, or take on a welcome aura of privacy when needed," says Michael Myers, Marketing director for Johnson Hardware. They also enable interior spaces to serve new purposes with each new day.- The result is a new kind of American home, one where rooms assume different personalities as occasions and spatial requirements change. Sliding doors are the smart designer's answer in creating openness within spaces that can't accommodate hinged, swinging interior doors. In today's homes, sliding doors have been given a literally and figuratively larger role in room decorating.-They can glide into place to create walls between rooms, or easily glide back out if wide open spaces absent of walls are desired. 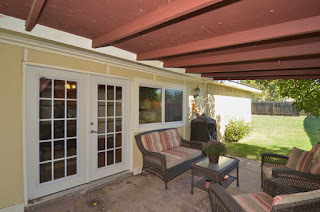 "Consider, for instance, the value of sliding doors during the holiday entertaining season. Large family gatherings may require adding a leaf or two to the dining room table, making that dining area a trifle too confining.-A wall of sliding doors can expand the dining room into the family room or living room, permitting the party to accommodate the arrival of unexpected guests," says Myers. The same functionality ensures the kitchen, increasingly seen as the "heart of the home," can serve as a cozy and intimate space for family dinners and neighborly coffee clutches, then morph into an expansive setting that permits easy mobility of place settings, food, beverages, hosts and guests between the food preparation areas, butler's pantry and dining room. On any given weekend, homeowners can be found climbing around in attics to add insulation, repairing shingles on the roof, installing new floors in kitchens and bathrooms, and handling many other home improvement projects that, with a little elbow grease, they are able to do themselves. This trend is crossing many generations. Forty-four percent of millennials (born between 1980 and 2000) and 57 percent of Gen Xers (born between 1960 and 1980) prefer to do home improvement and renovation projects themselves, according to Iconoculture researchers. One popular project that affects both the exterior and interior of the house is replacing a drafty old entry door with a stylish, energy-efficient one to transform the look and feel of the home without breaking the budget. "As interior and exterior focal points, entry doors add highly-visible curb appeal," Krafka Harkema says. "Whether you're expressing a certain style, your commitment to energy efficiency, or your passion for a particular color, Pella entry doors can help you reflect your home's unique personality." Fiberglass entry doors are a popular choice. They look like wood, but without the ongoing maintenance needs of wood. Plus, fiberglass offers exceptional energy efficiency, weather-resistance and outstanding durability to resist dents and dings. * Proper installation is critically important to ensure the door opens and closes smoothly and seals correctly to prevent air, light and noise from passing through. Take time to read and follow installation instructions. Pella products feature comprehensive installation instructions to make it easy to properly install them. * Take inventory of the tools you currently have. Determine what you will need for the project. If you don't have all the necessary tools, check with family and friends about borrowing items or consider renting them. * Ask for help from a family member or friend to help you complete the project. Extra hands can come in handy. Charming 4-bedroom, 2.5-bath home in Villages of Woodland Springs. Immediately you notice more than 1,000 sqft of Italian hand carved wood that continues up the stairs. Abundant natural light & space are welcoming throughout this home. Escape to your downstairs master retreat, featuring en suite bath with dual sinks, separate soaking tub & shower. Generously sized secondary bedrooms and gameroom wait for you upstairs. A pleasure to see & show! Winter and colder temperatures are notorious for creating difficult driving conditions that can place strain on drivers and their vehicles. And as the temperature drops this winter, so will your gas mileage. Colder temperatures mean cold oil, tires and cold air in the carburetor - all factors that reduce gas mileage. With higher prices lingering at the gas pumps, a few fuel-saving tips can help protect your miles per gallon (MPG) this winter. Many people believe the myth that you must warm your car up in the winter. The truth is that idling your car actually destroys your MPG and isn't necessary. Modern cars don't require a warm-up, even when the temperatures drop below zero, according to AAA. Modern engines, those built since about 1990, have fuel injection systems rather than carburetors and need no more than 10 to 30 seconds to get oil moving through the engine properly. Auto experts recommend driving moderately in cold weather to allow the engine and other systems to warm up slowly and reduce wear and tear. So even though many people choose to warm up their car in the winter for personal comfort or to defrost windows, idling a vehicle for more than even one minute is simply wasting gas. From changing the oil to checking the tire pressure on a regular basis, improving your winter gas mileage is easier than you might think. Proper tire inflation can also improve fuel economy by up to 3 percent, according to the U.S. Department of Energy. It is important to check tire pressure several times throughout the winter when colder temperature can reduce tire pressure at a rate of one pound per square inch (PSI) for every 10 degrees change. Extra weight from cargo or snow also reduces fuel efficiency. Cleaning out your car and clearing off snow is an easy way to get better gas mileage. As we count the days down to another day of thanks with our family and friends, we thought we would share a little history about its origins. The first Thanksgiving Day was the fall of 1621. President George Washington issued the first national Thanksgiving Day Proclamation in the year 1789 and again in 1795. Sarah Josepha Hale, an editor with a magazine, started a Thanksgiving campaign in 1827 and it was result of her efforts that in 1863 Thanksgiving was observed as a day for national thanksgiving and prayer. Abraham Lincoln issued a 'Thanksgiving Proclamation' on third October 1863 and officially set aside the last Thursday of November as the national day for Thanksgiving. Whereas earlier the presidents used to make an annual proclamation to specify the day when Thanksgiving was to be held. Congress passed an official proclamation in 1941 and declared that now onwards Thanksgiving will be observed as a legal holiday on the fourth Thursday of November every year. Benjamin Franklin wanted the turkey to be the national bird of the United States. But it was Thomas Jefferson who opposed him. It is believed that Franklin then named the male turkey as 'tom' to spite Jefferson. Each year, House Beautiful magazine builds its highly anticipated Kitchen of the Year, a showplace for what's hot in the kitchen. Designed around the latest trends, the annual Kitchen of the Year is the epitome of high-end style. But let's face it. The majority of us don't have the luxury of a 1,000-square-foot kitchen designed by a celebrated designer. Nor do we have the budget. Don't give up on your kitchen design dreams just yet. There are several ways to bring a high-end look to your home without the high price. With a little inspiration, research and proper planning, you can have a picture-perfect kitchen that will look as though it's been lifted from the pages of the top home design magazines. Get started creating your dream kitchen with these tips. Browse magazines, home design blogs and websites like Pinterest to gather inspiration. Take note of the kitchens that catch your eye and what it is that you like most about the design. Many of the things that you're drawn to are within your budget. Whether your style is classically traditional or more contemporary, there are cabinets, appliances and fixtures to fit. Whether your budget is under $10,000 or more than $50,000, you'll take pride in having a kitchen that was designed with your style and needs in mind. It's easy to be tempted with extras during the kitchen design process, and costs can quickly add up. Work with a professional designer to set and manage the budget, and help determine areas to invest and where to cutback. If you're drawn to elements of luxury kitchens, share that with your designer for ways to achieve a similar look. The cabinetry you choose can set the stage for the entire kitchen. While many high-end kitchens will have custom cabinets, you can achieve a similar look with semi-custom cabinetry at a fraction of the cost and without the extended lead times. The Grove Team would like to take a moment to begin wishing everyone a very safe and happy Thanksgiving holiday! We appreciate each and everyone of you and want to take this opportunity to say thank you for continued support of the Grovet Team, Keller Williams. May your Thanksgiving be filled with happiness! Managing money wisely: It's something that everyone is told to do from an early age. From putting pennies in the piggy bank to classroom instruction in how to balance a check book, the message is to spend and save thoughtfully. However, in the real world, those lessons often fall by the wayside due to crunched schedules, unexpected expenses and simple forgetfulness. However, the way you handle - or mishandle - your money from day to day will have an impact on your credit score. While many people only see their credit scores with their free annual check, a recent white paper by credit score model company VantageScore Solutions points out that roughly 70 percent of credit scores fluctuate by as much as 20 points in a 90-day period. Whether it goes up or down depends on your behaviors. 'When it comes to credit scoring, there are two questions that are most commonly asked by consumers yet rarely understood. These questions are 'why did my credit score change,' and, 'how can I improve my credit score. * Paying a bill late for the first time: Missing that due date will likely cause your score to drop. Try signing up for auto-pay to make sure your bills are paid on time. * Maxing out your credit card: When you are at or near the limit on your credit card, you'll see a drop in your score. By paying off your balance monthly, as is commonly advised, you can avoid the problem. * Inquiring about a new loan: This common activity can cause a small drop in your credit score. Credit rating agencies might be uncertain of why you need the added credit exposure. You can show them that it's simply a normal expansion by making payments on time, which will also help rectify the minor drop in your score. * Closing an account: You might want to think twice if you think closing an account is a good way to keep yourself from getting in credit trouble. Closing an account can actually cause a minor drop in your score, while scores get a boost if you have a long credit history with an account. How long-lasting the effects of a drop might be depends on the severity of the problem. The minimal drop associated with things like obtaining new credit or closing an account can be righted within roughly three months - as long as you're being otherwise financially responsible. However, a more major drop, like a missed payment or default, can last for nearly two years, and the biggest drop, caused by bankruptcy, can affect your score for seven years. There are many other everyday activities that can impact your score, and the Consumer Federation of America offers more ways to learn about them at www.CreditScoreQuiz.org. While cold weather causes many people to stay snug and cozy indoors, it provides a great opportunity for home buyers to get out and find their dream home. Fall and winter are typically considered the off season in the housing market, but actually buyers can potentially find better deals and sellers may find the most serious buyer. To take advantage of the benefits of off-season real estate, consider these important areas of advice. The off season is a great time to buy because you'll have less competition with other buyers and a reduced chance of getting in a bidding war that drives up a home's price, something that still occurs frequently. When you're not fighting with other bidders, you can make a sound decision and have a better chance of getting the seller to pitch in on concessions, such as closing costs or funds for improvements like appliance upgrades. Today's unique real estate market can be confusing for even the most savvy folks. That's why it's important to work with a real estate agent who can answer all your questions. Not all real estate agents have the same training and experience, so find one who has the background necessary to navigate complex situations. During the fall and winter seasons, it might be easy to overlook subtle home issues. Outside leaves pile up, snow drifts form and they may cover up problems with the siding, foundation or landscaping. A home that is currently vacant, whether it's a foreclosure or the homeowners already moved, may have internal issues due to freezing temperatures. Empty houses are typically heated less, and some, unfortunately, not at all. If a house you're interested in is vacant, make sure that it has been properly winterized or maintained so that you can be confident there are no issues with frozen pipes or a malfunctioning furnace. For sellers, the off season doesn't have to be a detriment to making a sale. Remember, staging your home so it looks organized, stylish and modern is a smart move. Take cues from the season in your decor choices, creating a clean yet homey feeling that will help potential buyers visualize their future in the space. Also, remember potential buyers may want to drive by your home before they schedule an official showing. With fewer daylight hours, it's important to keep lights on in the evening, so if they drive by, your home isn't completely dark. 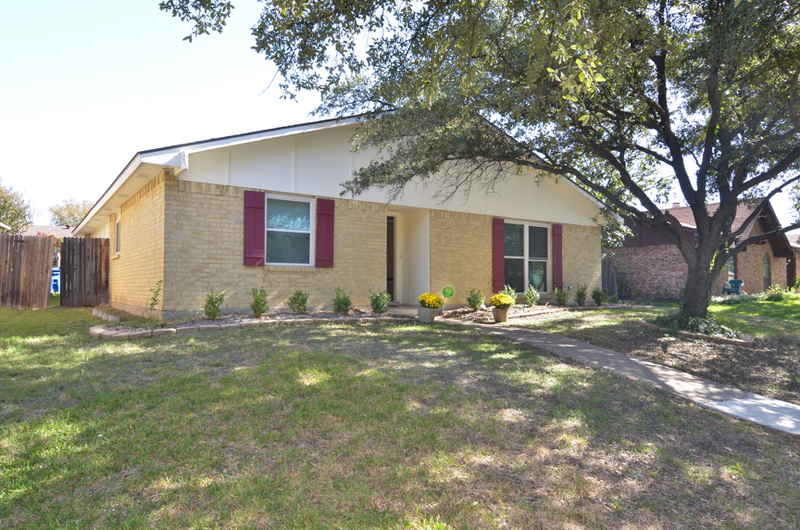 Handsome three bedroom, two bath home located in Keller! Freshly painted interior and new carpets and real wood flooring welcome you immediately as you come in. The open floorplan offers flexibility for entertaining and offers great natural light. The split bedroom set up is ideal. 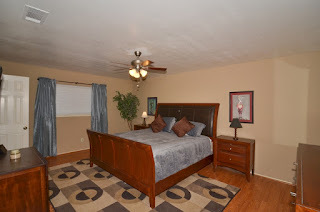 Additional updates include, natural gas added to kitchen, updated ductwork for HVAC, additional smoke detectors added in all bedrooms. Contact the Grove Team, Keller Williams to schedule your own private showing! The winter holiday season is here, which means we can look forward to a lot of decorating, parties and possibly some travel during the next few months. But with all the hustle and bustle of shopping and celebrating, it's important not to lose sight of what matters most: the safety of your family and home. From now until New Year's, you'll be expecting guests more frequently and your house will be filled with beautiful, but highly flammable, decorations. These range from the candles on your dining room table to the tree in your living room to the paper decorations on your walls. All of these items can contribute to potentially unsafe conditions in your home. 1. Always make sure burning candles are never left unattended (blow them out if you leave the room) and are placed at least 12 inches away from flammable objects. Candleholders should be sturdy and placed on a stable, uncluttered surface. 2. Make sure to check your smoke alarms monthly. They should be installed in every bedroom, outside each separate sleeping area, and on every level of your house. Replace the batteries in all of your smoke alarms at least once a year. 3. The holidays also mean travel for some families, and it's important to make sure your house is safe while you're away. Consider a home security and automation system that offers comprehensive protection inside and out. A customizable system allows you to control your lights, lock your doors, adjust your thermostats and watch your pets from wherever you happen to be via a computer or smartphone. 4. Make sure your decorations are safe. Only use items that are flame resistant or flame retardant, and avoid placing them near doorways or windows. 5. Have your chimney cleaned and inspected every year by a qualified professional. Make sure to use a fireplace screen to contain any sparks or hot embers. Once you put the fire out, let ashes cool, and then transfer them to a metal container with a lid. This should be kept at a safe distance from your house. Stunning renovation by TK Homes, LLC! Updated from head to toe...including new interior & exterior paint, new laminate flooring & carpet, new tile in kitchen, utility, & baths. 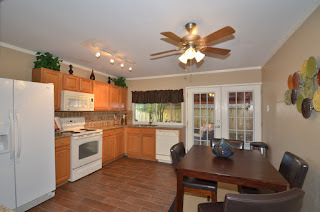 First class kitchen updates include granite, stainless appliances and offer ample counter-cabinet space. Well appointed throughout with crown molding and finishes...wet bar open to patio complete with inground gunite pool. So much to list, so little space! Call on the Grove Team for more information or to schedule a showing today! Exceptional renovation located in the Woodlake Addition! Enter into this 3-2-2 split bedroom floorplan featuring updated fixtures in the kitchen along with granite counters and porcelian 'wood' floors that offer the rich look of wood, yet the durability of tile. Intelligent design, custom master closet, newer roof (2011), new double pane, low-E, double hung windows, 13-seer HVAC, and wired for CAT-6 internet...too much to list, come see! 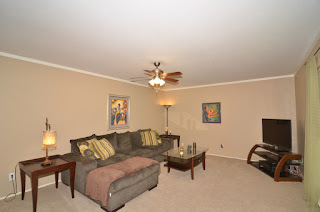 Call the Grove Team, Keller Williams Realty today to schedule your personal showing! As the leaves turn and fall to the ground, it's time to start thinking about “buttoning up” your home for winter to keep you and your family healthy and comfortable, your belongings safe and high energy costs at bay. Heating accounts for 34 percent of all annual utility usage, according the U.S. Environmental Protection Agency (EPA). One of the most cost-effective ways to improve the energy efficiency and comfort of your home is to seal and insulate the “envelope” - outer walls, windows, doors and roof. By doing so, ENERGY STAR estimates that a homeowner can save up to 20 percent on heating and cooling costs, the equivalent to lowering up to 10 percent of total energy costs for the year. Old, drafty windows and doors can account for home energy loss of up to 30 percent, according to the EPA, which means paying more in the winter to heat your home. By replacing non-performing windows and doors, homeowners can drastically reduce heating costs. A typical home that replaces its single-paned, clear glass windows with energy-efficient windows can realize up to $501 in annual savings, according to the EPA. Additionally, old or improperly installed siding can also be the cause of drafts. However, by installing new, energy-efficient vinyl siding and underlayment, homeowners can increase a homes' R-Value, a measure of insulation's ability to resist heat traveling through it. However, even the best windows, doors and siding can be drafty, if they are poorly installed. 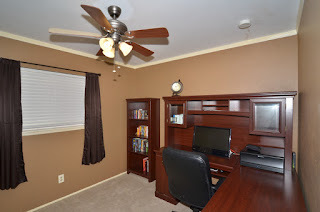 So it's important to make sure your home improvement is completed by a quality contractor who has a long history of being in the business so you can be sure they will be around if you have any issues down the road. Water leakage from snow, ice and rain can cause damage to the exterior and interior of your home. This can result in costly damage to framing, structure and insulation, more importantly it can cause issues - like mold - that can be harmful to the health of your family. The roof is often the site of leaks in homes; however, by installing a new roof and taking the proper precautions, leaks won't be a problem. Fall is often considered the coziest of seasons. Not too hot, but not too cold, there is something about the vibrant colors of leaves and crisp air that make you want to pull on a sweater and take in all this season has to offer. *Reread a classic. Cozy up with a classic book. A few of the most anticipated upcoming feature films are adaptations of classic novels. Take some time away from your busy schedule to revisit some of these books before they hit the big screen. Throw a few logs into the fireplace, put on your warmest sweater and relax with a good story, whether you're reading it for the first or 20th time. *Take a walk. There's no better way to take in the sights, smells and sounds of fall than being surrounded by the season. Enjoy the vibrant colors of leaves changing, the familiar smell of smoky bonfires and children jumping into massive leaf piles. It is the perfect time for long walks because temperatures aren't overbearingly hot and the humidity levels are much more tolerable. Dress appropriately for the cooler weather and see what fun you can have outside. *Help others. Fall is an excellent time to direct your energies and donations toward nonprofit organizations. For example, October is Breast Cancer Awareness Month, and you can participate in a fundraiser for any breast cancer organization or donate funds during this special month. *Harvest fall fun. Visit a local apple orchard or pumpkin patch. Apple trees are heavily laden with crisp and delicious apples this time of year. Head out to an orchard to pluck the perfectly grown fruits off trees bearing your favorite variety of apples. Or take children on a ride at a pumpkin farm. Let them run through the patch, inspecting every pumpkin for their perfect carving creation. *Feed your autumnal appetite. All of fall's exciting activities will leave members of your family feeling voracious. Warm them up - and create a delicious smell in your house - with a bowl of homemade soup. This simple recipe for Chicken Soup and Crackers is destined to become a fall staple. Place broth in a 3 quart sauce pan. Add the onion, carrots, celery, bay leaf, thyme, turmeric, salt, and pepper and simmer until vegetables are very tender. Add chicken pieces and frozen okra, and boil for 5 minutes. Nothing short of stunning! Enter into this richly appointed 4 bedroom, 2 bath home featuring wood floors throughout, granite counters with 42-inch cherry cabinets in the kitchen, stainless appliances including a double oven, plantation shutters and crown molding. Well maintained - this beautiful home also offers an extended back patio, electrical outlets in the eaves, & a new roof installed in 2012. Too much to list - a pleasure to see & show. With the changing of the season right around the corner, most Americans are beginning to clean up the exterior of their homes by raking leaves and cleaning out the gutters, but what about the interior? Fall can be the perfect time to revisit that spring cleaning list that you never completed and give the interior of your home a deep clean in preparation for the holiday season. While most people rely on their own cleaning know-how to tackle germs and dirt, they depend on their eyes to show what they think is a clean house. In fact, more than two out of three people believe that vision is the most important sense in determining the cleanliness of a home, according to a recent national consumer survey conducted by Stanley Steemer. But it's often the dirt that you don't see that requires help from the pros. Traditional at-home cleaning methods such as vacuuming and dusting only remove a relatively small portion of dirt, dust and particles that lurk in your floors and furniture. Without a deep cleaning, you'll be trapping dirt inside your home for the entire winter, which can impact the visual appearance of your home, while also elevating the risk of allergens in the home. Reduce the amount of dirt and leaves that may get tracked into your home by using indoor and outdoor entrance mats. Remember to act quickly to clean up any spills or stains; consider keeping a professional spot remover handy at all time or use items commonly found around the home such as white vinegar and baking soda. Keep up with the high traffic areas in the home by vacuuming them two to three times a week and the rest of your carpets at least once a week. Keep your windows closed and turn on the air conditioner when raking leaves and doing other fall cleanup work outside. These activities kick unwanted dirt, dust and pollen up into the air, which can settle into upholstered furniture and carpet. From cooking to entertaining, the kitchen - always the heart of the home - now takes center stage as the 21st century hub of the home. As families spend more time in their homes, today's “command central” kitchen needs to be multi-functional and high-definition ­­with easy-to-maintain surfaces dedicated to cooking, working, Web surfing and blogging, paying bills and doing homework, as well as creating a comfortable environment to entertain with family and friends. Saturday, October 26 • 6 p.m. to 8 p.m.
Join us on Friday, October 26 at the Keller Pointe Indoor Pool, 405 Rufe Snow Drive, for the largest floating pumpkin patch that you'll ever see! From 6 p.m. to 9 p.m. participants will have an opportunity to float through the patch and select their own pumpkin for the Halloween season. Pre-registration is required and a fee of $10 per participant applies for advanced registration or $14 the day of the event. For more information follow this link or contact 817-743-4386 or thekellerpointe@cityofkeller.com. Saturday, October 27 • 7 to 9:30 p.m.
Saturday, October 27th from 7 to 9:30 p.m., head on down to the Big Bear Creek Greenbelt for ghostly good time along the 'Haunted Trails' of Keller. Beware of who or what may be lurking along the trail. The event may be too scary for some children. For more information follow this link or contact 817-743-4050 or email parksandrec@cityofkeller.com. Sunday, October 28 • 2 to 5 p.m.
Children age 11 and under are invited to enjoy an afternoon at Johnson Road Park as it is transformed into a 'Spooky Kooky Keller Kastle' from 2 to 5 p.m. Sunday, October 28. They will enjoy the haunted playground along with carnival games, prizes and candy. The event is free for all those attending. Come in costume and have loads of Halloween fun! For more information follow this link or contact 817-743-4050 or email parksandrec@cityofkeller.com. Selling a home in today's market requires a bit of marketing, some sweat and elbow grease, and a touch of luck. But even in a competitive selling market, it is possible to turn the sign in your front yard from “For Sale” to “Sold” so you can move on to your next residence. First, look at your home as if you were a potential buyer. Drive up to the driveway or the front curb and park, carefully looking at the home as if for the first time. Make note of the beautiful aspects of your home, and also areas that could deter potential buyers. The outside of your home is the first image they will see, both in person, and while pre-shopping online. One maintenance project to tackle that will really spruce up the exterior of your home is refurbishing the outside woodwork that has been weathered by the sun, rain and snow. If you have a front porch, wooden window edgings or even a back deck, chances are these areas could benefit from new stain for a refreshed and clean look. Home decks return about 70 percent of their original cost back to homeowners when a house is sold, according to Remodeling Magazine's annual Cost vs. Value Report, but that's only when the decks are kept in top shape. To remove moisture and sun damage and protect your exterior woodwork from further damage from moss, mold and rot, Flood wood care offers an entire wood care system from prepping materials such as deck cleaners to stain. Before prepping your deck, consider if you need Wood Finish Remover to remove latex, oil, semi-transparent and solid stains, or if your deck is unstained, you may need Wood Brightener/Cleaner to bring the old and faded gray coloring back to a fresh new wood appearance. Finally, apply a Flood wood stain to your deck and woodwork to give it a beautiful look that will have home buyers and your neighbors impressed. In addition to your exterior woodwork, also take a look at your siding and gutters. Vinyl and aluminum sidings can collect dirt and look dingy after a season or two. Use a power washer on the siding and gutters to wash away the grime and spider webs and bring some vibrancy back to the outside of your home. Also consider adding season-appropriate flowers, plants or landscaping or replacing gutter downspouts with decorative chains to give your home an artistic look. Finally, take a close look at your exterior lights. Glass-enclosed lights can become filthy from all the elements, so take a quick moment to wipe them clean with glass cleaner. If your light fixtures are tarnished, or looking run down, purchase a can of spray paint in any complimentary color to the exterior of your home and freshen them up. It will make your lights appear new in no time at all. Natural stone is one of the most sought-after upgrades in a home. Providing both versatility and timeless beauty, it's no surprise that granite is the most popular natural stone option. Though very durable, the composition of stone can make it sensitive to damage through daily use. By understanding a few important do's and don'ts, you can easily keep your home's natural stone looking as good as the day it was installed. Natural stone like granite, marble, travertine and slate is commonly used for countertops and backsplashes in kitchens and bathrooms, two of the most-used rooms in a home. With the daily activity associated with these spaces, it's important to keep in mind some important stone maintenance tips. Whether you have granite countertops in your kitchen or travertine tile in your bathroom, there is a correct way to clean the natural stone in your home. Many homeowners are tempted to use all-purpose cleaners or bleach to keep stone surfaces clean, but these types of cleaners may actually damage your stone. Cleaning products that contain vinegar, lemon or other acidic ingredients can dull the surface, reducing the stone's luster and eating away at the sealer. Ammonia-based cleaners should also be avoided as they can cause the stone's surface layers to wear off over time. Do you want to know what cleaners are safe for granite and other natural stones? Smart homeowners only use specially formulated cleaners. Because natural stone is porous, spills can be absorbed, even if the stone has been sealed. That's why it's important to clean up food and liquid as quickly as possible. Acidic spills such as orange juice, tomato sauce and sodas are examples of kitchen spills that should be cleaned up immediately. In the bathroom, shaving cream, body soap and perfume spills are concerning. These types of spills have a higher potential for damage and cleaning them up quickly will help to prevent staining and etching. Granite and other types of stone can be professionally sealed during the installation process, providing an extra protective shield. But sealing is something that needs to happen regularly to sustain this barrier. Maintaining the sealant is easy by using a cleaner with sealant built in, that rejuvenates stone and grout seals without leaving residue.